The plan has now been executed. On Saturday Scott and I took a drive out to Middleburg Virginia to pick up our beautiful red wine barrel from Chrysalis Vineyards. The winemaker had rinsed the barrel out with hot water on Friday night and ozonated it to keep the microbes at bay (not that we really care if a bit of wild yeast is living in there). The barrel was coopered by Saury Tonnellerie in Rutherford CA (to me it looks like the Bordeaux Chateau Ferre which is made of French oak). Other than that though we don't know much about it, the winemaker wasn't sure what sort of wine was in the barrel last, or exactly how old it is. The aroma of the empty barrel was fantastic, deep red wine and fresh grapes (very clean), hopefully some of that aroma is endowed onto the beer. 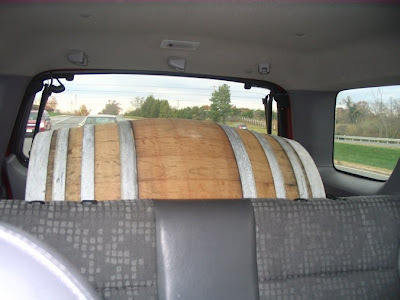 We were surprised that the barrel could fit snugly behind the rear seats in Scott's SUV. My friend Tim had donated a homemade barrel rack (constructed from a wooden pallet). We got the rack into position in the Nathan's basement and the barrel onto the rack. Once the barrel is filled it weighs about 600 lbs, so it won't be going anywhere until we take the beer out. Sunday afternoon everyone brought their contributions over to Nathan's. All told, six people contributed a total of 45 gallons of attenuated beer, two people gave five gallons each of sour beer, and 1 person gave 5 gallons of fresh wort. We racked all but five gallons of the sour beer into the barrel to leave some head space. The combined gravity of the 55 gallon blend was around 1.028, so there is some serious fermentation still to be done. Lucky the transfer was drama free, no leaks, and no spills. The blowoff tube (stuck into a #10.5 stopper) was bubbling within 10 minutes of getting the last of the beer into the barrel. I'll be brewing 5 gallons of top-off beer soon as we will probably loose that much over the next year to evaporation. We are hoping the beer will be ready to bottle in about a year, but it may take longer depending on how quickly the bacteria gets to work. Once this beer tastes ready we will all brew a new beer to fill the barrel back up again (hopefully on the same day we get together to bottle the 24 cases of Flanders Red). 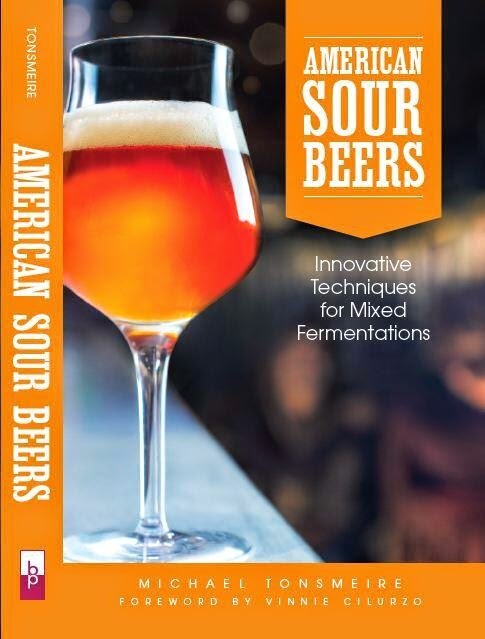 I like the idea of doing a big sour beer, hopefully my first attempt at the "style" will be ready to try by then. Discussion has already started about getting a second barrel (the rack has room for two). We have a couple leads on a bourbon barrel, so we will probably make something big, dark, and clean (Imperial Porter or Stout probably). This one was bottled a bit less than a year later. So, it's to finish fermenting and age in the barrel over the next year or will you judge when to bottle by taste? Yeah, the lactic acid bacteria and wild yeast from the two already soured batches will slowly ferment the sugars from the other "clean" batches. In addition to tasting good (sour and funky) we need to wait for the gravity to stabilize, so we don't risk over-carbonated beer. 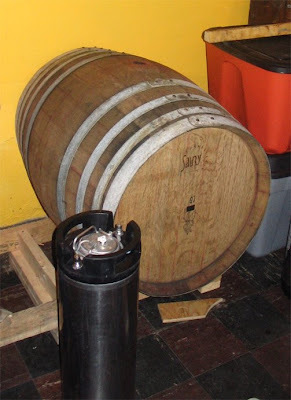 During aging the beer will also pick up oak and wine aromas from the wood and mildly oxidize. This sounds fantastic! I'm curious... did everyone brew from the same recipe? Would you mind sharing it? Check out "The Plan" linked right at the start of the post, it contains the outline recipe that everyone tried to follow. For the most part people did a good job, but a couple people made minor mistakes or couldn't get the right ingredients. With 60 gallons being blended some minor errors in 5 or 10 gallons shouldn't make a noticeable impact on the entire batch. 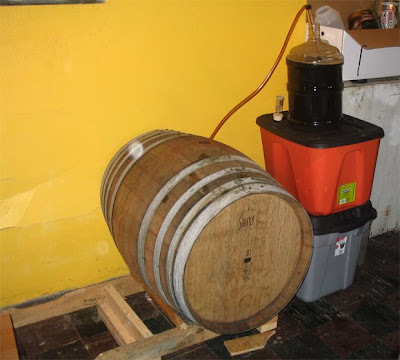 I know this is an old thread, but i was wondering if you could pull this off somehow with just soaking some oak cubes/chips in some wine for a while and then putting the oak into secondary with the beer. would it be a sour or could you avoid that? You certainly could (and I certainly do) age a beer on oak cubes soaked in wine (or any other alcohol for that matter). I would also add a cup or two of wine, to boost that character, since are not soaking the wood for years before adding it to the beer. You could also skip adding the wild yeast and bacteria if you don't want it to be sour/funky. That said, of course both of these changes would have a profound impact on the character of the beer. thanks for the respone. what type of beer would you think would lend well to this type of wine/oak treatment if i were to stay away from the sour? porter is one of the first that comes to mind, but what are your thoughts? and do you need to treat the wood after soaking somehow or is there no risk of infection due to the alcohol of the wine? I would probably steam the oak first because Brett loves oak, assuming it is fresh/clean wine there shouldn't be much risk of infection from there. Captain Lawrence does a great wine barrel aged smoked porter. Anything Belgian would work as well, as would many other American styles. Wine is not as assertive as bourbon or other spirits, so I would try it in a more subtle beer (skip the Imperial Stouts and the like). 1-2 oz of oak is a good place to start, you can always add more if needed. The longer you can age it the more complexities you will get. Good luck brewing, should be fun.